This is the third part of a multi-part article on how to improve your search engine rankings (SEO) using WebWiz@rd and other methods. Whenever you insert an image or a link on your website, use keywords to describe the image or link by filling out the “Alternative Text” or “Advisory Title” field to describe it (again, using keywords). This allows the search engines to understand what the image or link is all about. This is easily done in WebWiz@rd. 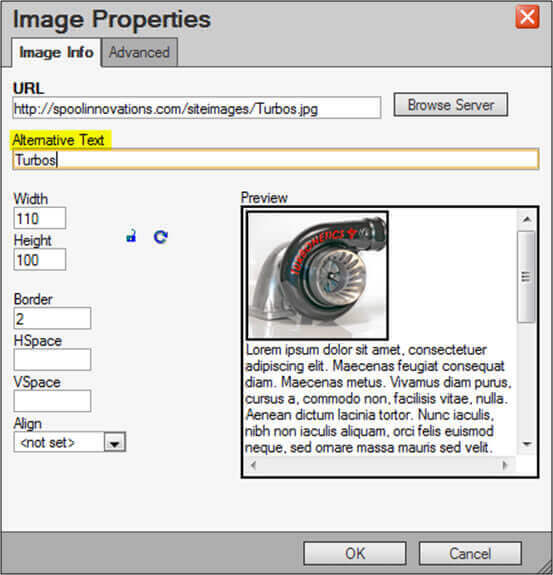 The first image below shows the "Alternative Text" (aka Alt attribute of an image) field in WebWiz@rd when insterting an image. You should describe what the image is about so the search engines can use those keywords as if it was text on a page. You can also add a similar feature to links on your website. If can offer a few keywords about what the link is. For example, if you were to create another page to discuss more information about a product you might do something simlar to the below example. When you fill in the "Advisory Title" (aka title attribute of a hyperlink) field it will also allow search engines to understand more about what that link is. Stay tuned for our next quarterly newsletter where I will start talking about Descriptive page names. Many customers come to us with questions about disk space and bandwidth usage. According to Wikipedia, disk space is an amount of computer storage space on random-access memory devices, such as on a hard drive (Source). For REM customers, this means that their disk space usage is the amount or number of files they have in the WebWiz@rd 3 File Manager. Wikipedia defines bandwidth as a term used to refer to various bit-rate measures, representing the available or consumed data communication resources expressed in bits per second or multiples of it (bit/s, kbit/s, Mbit/s, Gbit/s, etc.) (Source). What does this mean to you as an REM Web Solutions customer? Your bandwidth usage, simply put, would be how much traffic your site creates. Or in other words, how many people are visiting your site. Click here for more information about Web and Email hosting. Happy New Year from REM Web Solutions! REM Web Solutions hopes everyone had a fun and safe holiday and we wish you all the best in 2013!